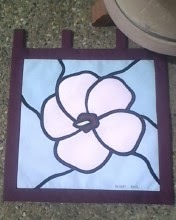 Stained Glass; Fabric is 100% cotton. 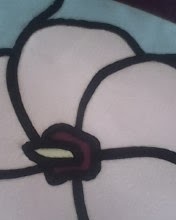 Background is varying shades of light blue; flower is pale pink; border is burgundy with black bias to form the stained glass effect. It was a windy day for taking photos so the last tab is anchored under a pot. It looks just like stained glass. Verg clever!